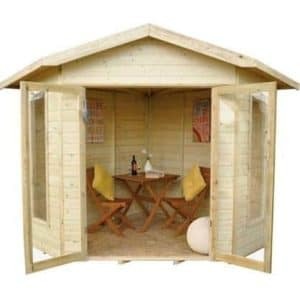 With a very modern look, the Forest Honeybourne Pressure Treated Corner Summer House is one impressive looking structure that just has a whole lot of class. The modern design makes this a corner summer house that would be perfect as a place to have fun with your friends, spend time with the kids or even as a work space. It can be all these things as it offers you a very good amount of floor space to make use of. Add to this the impressive headroom and you have a whole lot of room to play with. A gorgeous looking pent/apex roof really makes this stand out and those large windows give it a very open and friendly appearance. The wood has been pressure treated which means that this is one very strong summerhouse. The tongue and groove cladding that they have used is not just very strong. It is also so well made that it is impossible for water to sneak its way in. A very well made frame has been used to keep the structure secure and the framing even extends to the roof which will give added strength to the solid sheet boarding used for the roof. 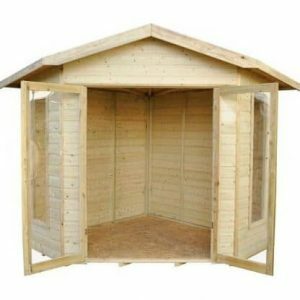 Today we are looking at the Forest Honeybourne Pressure Treated Corner Summer House. Now this is a corner summer house that certainly does give off a very strong first impression. It’s more lighter coloured wood really does capture your eye and make this something that would work very well as a place to have a little fun or even as a home office for you to do a little business in. It is actually a very good size, with the width being 11 feet 5 inches and the depth an equally impressive 8 feet 3 inches, so as you can see, you are going to have a very good amount of room to make use of in here no matter what you decide to use it for. At its highest point the summerhouse is an incredible 8 feet, so you are going to have a very comfortable amount of headroom inside of here. Now the roof on this corner summer house is one of the most impressive and unique looking roofs we have seen in quite some time. Now the roof is mainly a pent style roof with it sloping towards the back, but right at the front it has an apex design which really does make this look very unique. As a matter of fact we are having a hard time thinking off the top of our head when we have seen a roof that looks like this. There is a very slight over hang round the front and the sides of the summerhouse which along with the fact the roof slopes towards the back is going to stop rain running down the front. Solid sheet boarding and high quality sand felt is what the roof is made from which usually is fine, but we feel at this price point a tongue and groove roof would have been better. Some strong and thick tongue and groove shiplap cladding is used for the Forest Honeybourne Pressure Treated Corner Summer House. We really like this type of cladding as with it being thick it is first of all very strong, but due to the way they have really make this cladding interlock together tightly, you will never have to worry about rain getting inside. One other thing we have to mention is the very smooth look that the cladding has which gives it a very high quality and stylish look. The fact it is pressure treated also means that it is going to stand up to the elements very well. For some odd reason they do not actually tell you what kind of frame is inside here, but we are an eagle eye bunch here at WhatShed, so we took a really close look and can say that the frame they have used is just ideal. As you can see in the pictures, they have used a nice thick frame for this corner summer house. This is really going to ensure this is a very robust structure. Plus if you take an even closer look, you can actually see that there is some framing on the roof as well. This is just fantastic and will help make that solid sheet boarding much stronger. 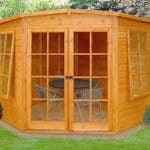 Solid sheet boarding is what they have used for the floor and in a budget priced summerhouse this is perfect. But we do feel that they could have used tongue and groove boarding for the floor here. We said this for the roof as well, but we do feel the floor even more so than the roof would have benefited from tongue and groove boarding. Still though we do not want to be too negative and say that with some laminate or even a smart looking rug, you will keep that solid sheet boarding hidden pretty well. 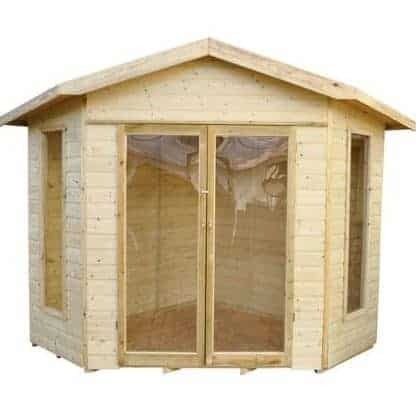 The Forest Honeybourne Pressure Treated Corner Summer House is actually pressure treated so no need for you to get paint all over the grass or your pants. Being pressure treated though does not just mean you do not have to treat the wood yourself, it also means that the wood is much stronger and better equipped to deal with the beating our British weather is going to give it. As this is pressure treated you are getting a very generous 15 year anti rot guarantee with this corner summer house. That shows just how much faith they have in their pressure treatment process that they are willing to give such a lengthy warranty. 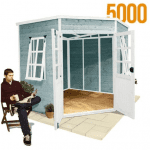 The doors take up most of the front of the summerhouse and as these are double doors, you will find getting larger items like a table, chairs, desk or whatever is not going to be hard at all. The doors are mainly made from styrene windows and we feel that they look fantastic. A good sized door handle is on each door and there is even a latch that will prevent the doors from blowing open in the wind. As well as the doors, each side of this corner summer house has a large fixed window on it. Like the doors these are made with styrene. This is great if you have kids playing in the garden who like to kick a ball around or just throw things in general, but we do feel that some toughened glass would have gone very well with the pressure treated wood. 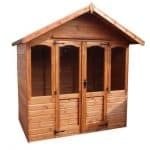 The Forest Honeybourne Pressure Treated Corner Summer House we must admit is lacking in the security department. There is no locking mechanism included here so you will have to add something if you plan on keeping more expensive items inside. We are a little disappointed that there is no lock here, but that is something you can take care of yourself. The windows are very large so if you do want some privacy then you are going to have to purchase some curtains or blinds, but we actually feel they windows look great fully open, but we get that is not to everyone’s taste. They are not offering any customisation options at all with this corner summer house. But to be fair with the wood being pressure treated, we would not actually suggest you start messing around painting it anyway. 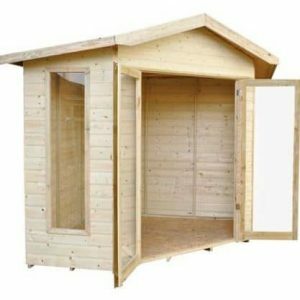 No extras are offered with the Forest Honeybourne Pressure Treated Corner Summer House, but one thing we highly recommend you think about is a padlock to keep the doors securely closed. It does not have to be anything expensive something as simple as a chain and a padlock would work wonders on those door handles. The pressure treated wood they have used is clearly the main selling point of this. We just wish they had used tongue and groove boarding for the roof and the floor. You are going to get many years of use out of this corner summer house. The fact that it is pressure treated means that you actually do not have to do a whole lot to keep it looking good either which is a very nice bonus. We are impressed with the floor space that this offers. You are going to be able to fit a whole of stuff inside here. Not only that, but the impressive headroom also means that it is going to be comfortable for even very tall people. You will need to talk a friend or family member into helping you out. We find the promise of regular cups of tea and biscuits is the best approach. You are looking at 8 hours at the most to install this. A couple of more skilled DIY enthusiasts though will have this up in no time at all. The fact the wood is pressure treated is fantastic, but we would have expected at the roof and especially the floor to be made with tongue and groove boarding at this price range. 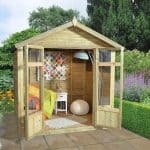 Final Thoughts: The Forest Honeybourne Pressure Treated Corner Summer House is one very smart looking structure. We are sure many people are going to look at it and just fall in love right away and hit that buy it now button. 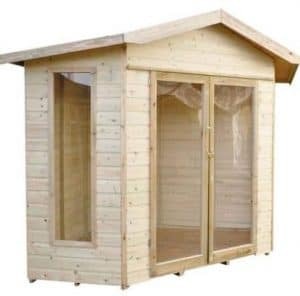 While there are some very impressive aspects about this summerhouse such as its size, pressure treated wood and those large double doors, there are a few things like the roof, floor and security that we feel could have been done a little better. Still, there is no denying this is one gorgeous looking summerhouse and we are sure that if you can put up with a few nit picks, you will be very happy with it.